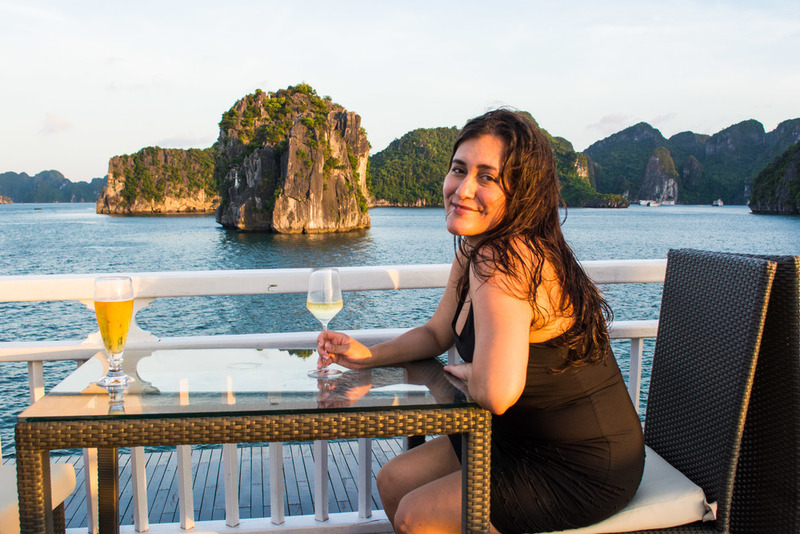 Halong Bay is without a doubt, one of the most breathtaking areas of Vietnam -- and a cruise is the absolute best way to relax and take in all of its natural beauty. Imagine a place where hundreds of limestone islands reach up out of the sea. Where over the course of thousands of years the wind and water has eroded away these tiny islands to form them into almost mystical shapes. Where you're surrounded by a completely surreal landscape, that's what Halong Bay is like. And there is literally no other place in the world quite like it. We had an opportunity to experience this amazing place first-hand on a 2-day cruise with Paradise Cruises. Honestly, it was easily the most memorable 2 days of our entire time in Vietnam -- and definitely ranks as one of our favorite experiences of our entire round the world trip. So whether your trying to plan a Halong Bay cruise, or if you just want to live vicariously through us, please keep reading! And if you've already been to Halong Bay, be sure to share your experiences with us in the comments below! Before leaving for Vietnam, several friends asked if we were going to visit Halong Bay. At first, we quickly replied with an emphatic "no". When initially planning our trip we had come across many bad reviews of Halong Bay; The ships were old and dated; the area was overrun with tour groups; The cruises were basically "party boats" with people just hanging out and getting drunk. And last but not least it was a 4 hour drive to get there from Hanoi. On the other hand, many people did say how beautiful it was, and how it's just something you "must see" -- not just in Vietnam -- but in the world. It's also UNESCO World Heritage site, which tends to be a pretty good "stamp of approval". We must have also have been asked by at least 10 different Vietnamese people whom we met; "Are you going to Halong Bay? ", and each time we said no, they seemed completely shocked -- as apparently it's even a place the Vietnamese themselves love to visit. So after a week of being in Hanoi, we took a chance and decided at the very last minute go for a 2 day cruise in Halong Bay! Once we decided to book a Halong Bay cruise, we quickly learned that picking the right "junk" (that's what the boats are called) would be key to our experience. With so many options it was a little overwhelming trying to sort through all endless websites and reviews. We did a lot of googling, emailing and reading reviews, as there are a TON of boats that tour Halong Bay. We saw prices ranging from as inexpensive as $25 USD per person per night all the way up to $2,000 USD per person per night. Now, we aren't the type of travelers that really like to “slum it” -- but we're also not millionaires -- so we focused on looking for a smaller boat with really great accommodations and a few good, but relaxing activities. In the end, we opted to go with the Paradise Peak Cruise offered through Paradise Cruises. What sold us was the fact that boat only had 8 rooms, so we wouldn't be packed in with lots of other people. And we also appreciated how we could customize the activities we did while aboard. Our trip started early in the morning when a van from Paradise Cruises picked us up in Hanoi. Upon arriving in Halong Bay, we were led into a large waiting area where they were serving food and drinks to all of the other guests who had also arrived that morning. The buffet they offered was not too memorable, although after a four hour drive we still dug into it with wild abandon. It was kinda like that feeling you get when the food service cart comes out on an airplane -- you don't care what it is, you're just ready to eat whatever they put in front of you! After about 30 minutes we were shown to our boat, where we were greeted with cocktails and introduced to our butler (yes, we had our own butler! ), who then led us to our room. After our introduction to the boat and crew, our butler, Lisa, led us to our room. Upon opening the door, we were completely shocked... Our room on the boat was nicer than most hotels rooms! Not only was there a king size bed, but also dining area, a full bathroom, and a large private terrace with two lounge chairs. The best part of the room however was the windows. Essentially, one whole wall of the room was glass, allowing us a panoramic view out onto the beautiful scenery of Halong Bay. One of our favorite aspects of the room was our private terrace. It was large enough to easily fit two full sized lounge chairs and was shaded to block out the blazing hot sun. We also really appreciated that it was fully private, so we were able really feel completely relaxed out there. We've been on boats before, and always dreaded going anywhere near "the head". However, the bathroom we had in our room would put almost any other to shame. First it was nearly as large as the bedroom, and the bathroom also had a whole wall was made completely of glass. There was also a second private terrace located off the bathroom. In addition, it had all of the normal bathroom accoutrements you'd expect like a sink and toilet; , but also a few that surprised us; like a full sized jacuzzi tub, a separate shower (large enough for 2 people, wink, wink). The Paradise Peak only has 8 rooms, but it is by no means a small boat. In fact, it was so large that even though there were 16 other guests aboard -- and another dozen os so crew members -- we felt completely alone much of the time we were there. In addition to the private terraces in each room, there were multiple sun decks, a bar, and a large dining area where you had breakfast, lunch, and dinner. Basically everything you need for 2 days at sea! And, because the Paradise Peak takes a route through Halong Bay that not many other boats use, we really never saw another boat the whole time we were out. 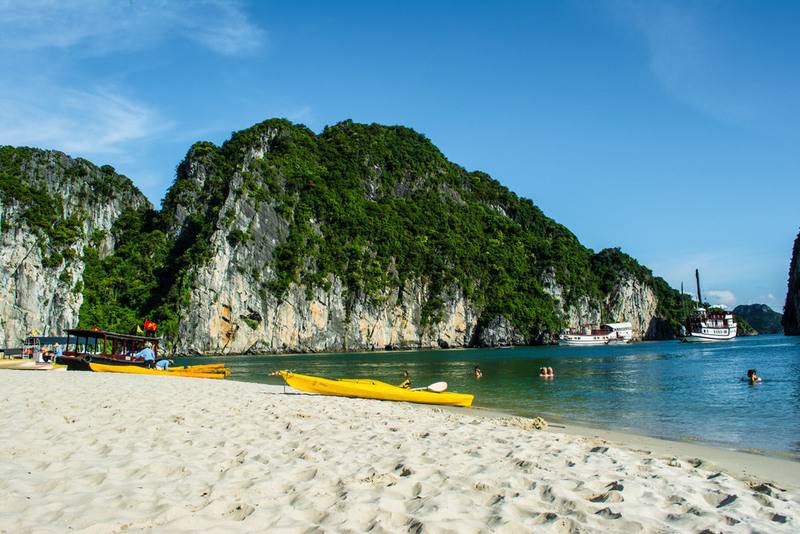 On the first day out in Halong Bay, we were given the choice of 3 different activities; kayaking around the bay, going to an tiny island with a private beach, and staying aboard the boat and relaxing. We opted to go to the beach and had a great time swimming and laying out for a few hours. The water was clean, clear, and best of all -- as warm as bathwater. The second day we where given the choice between a tour of Song Sot Cave, and hiking to the top of Ti Top Island. Not being the "hiking" type, we choose the tour of Song Sot Cave. To be honest, the tour was pretty good, but not great. It's a cave, there are bats, it's kinda damp and dank, and worst of all, it was like walking around in a steam bath. We were there in July. The temperature was in the low 90's with 100% humidity. After walking around in the cave we were both completely drenched in sweat. On the plus side, the tour guide was awesome, he was really funny and informative. Also, at the top of the cave you can get an absolutely amazing view of Halong Bay. We were excited to be able to spend a few hours swimming at this beautiful beach. The scenery: Ok, thats obvious. If you're going to Halong Bay it's for the scenery -- but it truly is as good as people say it is. It's on par with the Grand Canyon in the United States in terms of "WOW" factor. Watching the sunset: One of our favorite parts of the cruise though was heading up to the top deck with cocktails and some light snacks to watch the sunset over Halong Bay. It was an unforgettable experience! Waking up to see Halong Bay from our bed: Imagine waking up and the first thing you see are a hundred beautiful limestone mountains dotting the horizon! Its a view thats hard to beat. This was our view for 48 amazing hours! Food options: Unfortunately, there were not many different options for lunch and dinner. Also, much of the food on the boat was geared towards tourists. So the food was Vietnamese(ish) but it just wasn't what we were hoping for. Though in fairness we should say that we were at our happiest when sitting on a sidewalk stool in Hanoi eating in some random street food! Drinks on the top desk at sunset was a perfect way to end the day! WIFI? What's that? Leave your phone, iPad, computer, and whatever else connects to the internet at home. There is no WIFI/Internet options out on Halong Bay.It just does not exist, so forget about it. At night however, when we anchored close to a town, you could sort of connect to the internet -- but only from the top deck, and only if you were holding the phone up really high, and only if you were perched on your tippy toes. And then only if you we're lucky. Getting there (and back): Halong bay is a 4 hour drive from Hanoi. In addition, we had to wait 2 hours after the cruise ended to get onto the shuttle. Also, the shuttle did not have great air conditioning, and the seats were made of some strange "pleather" like material, so every20 minutes or so we had to peel our sweaty bodies off the seat (which made a weird sucking sounds each time). In retrospect, we should have hired a private car to take us back to Hanoi. Oh well. Live and learn. Presentation counts: If your researching a cruise and the website seems shady or really outdated then their boasts and cruises are probably the same. 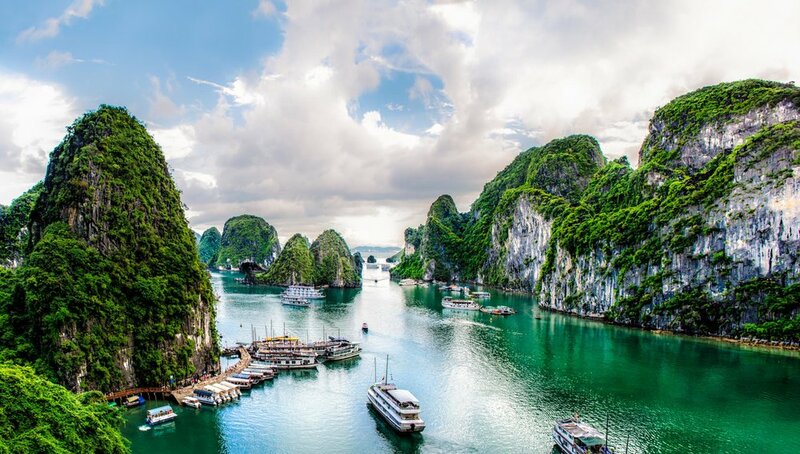 Beware of "stock" photos: If the only pictures shown on the cruise companies website are of Halong Bay and not of the rooms, you should wonder what they are hiding. Odds are the rooms are crappy. A/C is required: Make sure your room has air conditioning. It get’s hot on Halong Bay and trust us, you’ll welcome a nice cold room to relax in. 2 nights is enough: Most cruises are 1 or 2 nights and really that’s all you need. Our cruise was 1 night and 2 days, and while we could have easily stayed another night, with 2 days we felt like we had enough time to see everything we wanted to see and still have a relaxed time!